Marketwired: Movidius announces Myriad 2, the next generation of its vision processor unit (VPU) SoC. 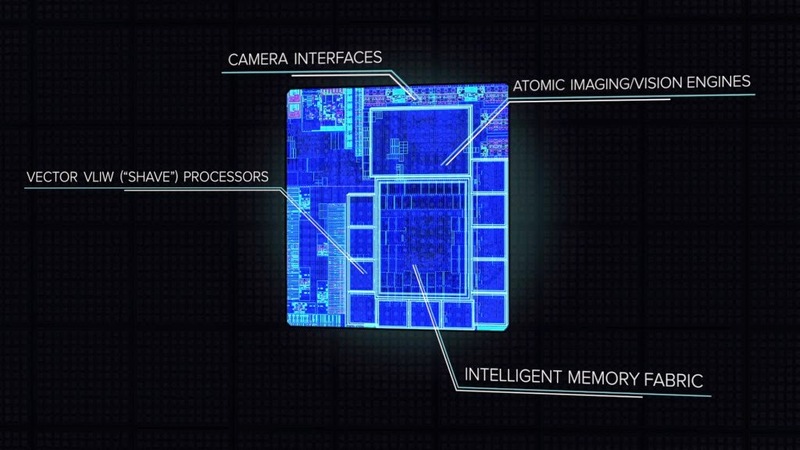 Compared to Myriad 1—which was introduced as part of Google’s Project Tango—the new chipset delivers 20x more processing efficiency in terms of computations per watt of power consumed. Myriad 2 comprises a larger and upgraded set of programmable processors as well as a new set of dedicated and configurable image and vision accelerators to power the next wave of computational cameras. Superior performance at ultra-low power: Myriad 2, implemented in TSMC 28HPM process, is capable of performance exceeding two trillion 16-bit operations per second while consuming an average of less than 500mW. It supports up to six full HD 60fps camera inputs simultaneously via 12 1.5Gbps MIPI lanes. 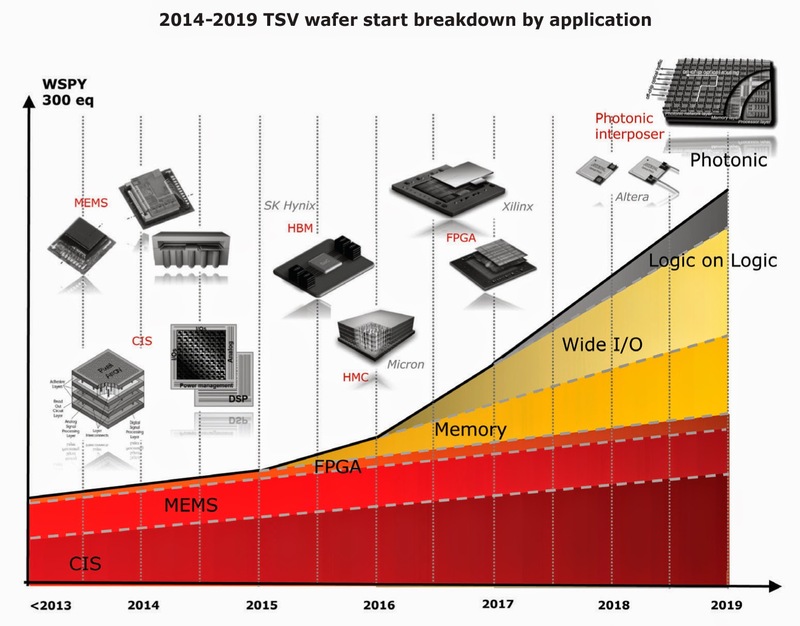 Q: What are the major growth areas in the image sensor business in 2014/5? A: Along with general market growth in the volume segments, there is a trend towards physically larger sensors to improve all around performance. While the pixel-count war is not dead, the top mobile OEMS have seen the light. Smaller pixels matter, but are being seen as enablers for unique features rather than just a way to use more power and memory, while larger pixels are getting the credit they deserve for image quality. Q: Which advanced technologies do you think will have the greatest impact on the supply chain in the coming years? A: Stacking of pure pixel arrays onto ASICS is going to be a very important change to the supply chain. Packaging of image sensors into camera modules is in an innovation phase now. Things like curved sensors will have an interesting impact on optical design, and could enable some changes in the module that will allow new technologies to flourish. Multi-chip solutions are going to become more popular, and advances in heat management are going to drive camera performance. With pixel shrinks and the demand for greater performance, I believe that pixel level optics (color filters, micro lenses and pixel-scale light path engineering) is changing quickly. It used to be just spinning on some organics, but it is now much more complex and essential to the sensor's overall performance. Albert Theuwissen announces that as the 1st session of 2014 Solid State Imaging Forum is almost sold out, the 2nd session registration opens. The 2nd session is scheduled for Dec. 15-16, 2014, same location. The sensor resolution is up to 150MP (12288 x 12288 pixel). 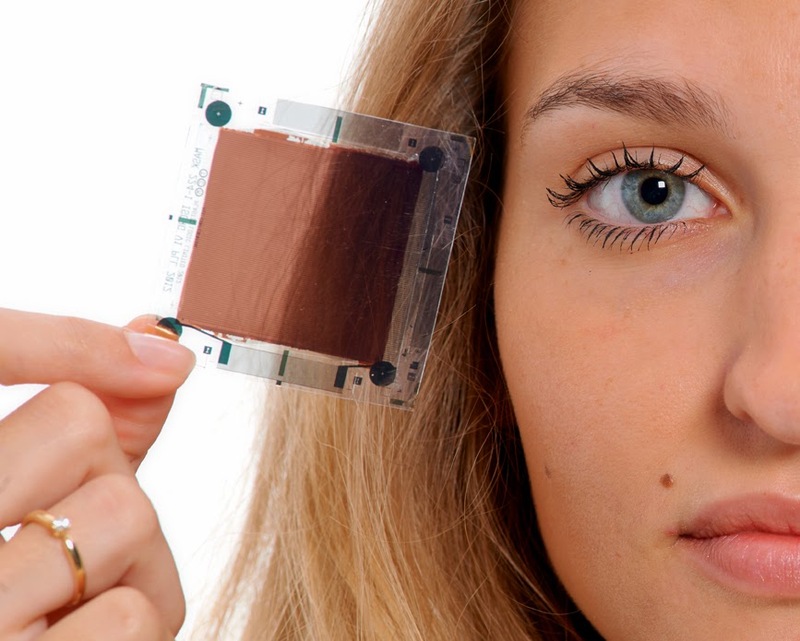 No silicon results yet, but the tapeout was scheduled for May 2014. DPReview quotes another rumor from Chinese website saying that the next generation Sony Xperia Z3X smartphone is to feature the IMX271SMK curved sensor and is scheduled to appear on the market sometime in 2015. The camera phone lens is unusually bright at F1.2. Sony plans to invest 35 billion yen in its Nagasaki Technology Center ("Nagasaki TEC") and Kumamoto Technology Center ("Kumamoto TEC") from the H2 of the fiscal year ending March 31, 2015 (FY14) through the H1 of the fiscal year ending March 31, 2016 (FY15), to increase its production capacity for stacked image sensors. The investment is intended to reinforce Nagasaki TEC's "layering process" production capabilities, as well as Kumamoto TEC's "mastering process" facilities. "The layering process refers to the layering semiconductor chips containing back-illuminated structure pixels with semiconductor chips containing the circuit for signal processing. The mastering process refers to the manufacture of photodiodes and wiring processes for stacked CMOS image sensors." On January 29, 2014, Sony announced its plans to establish and invest in Yamagata TEC as a facility mainly conducting the mastering process. 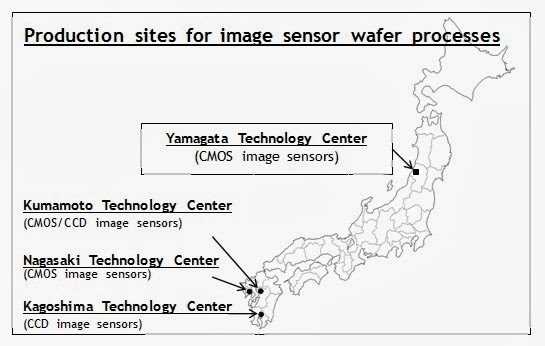 The current investment is expected to enable Sony to complete subsequent stages of production, including the layering process, at Nagasaki TEC on semiconductor chips that have undergone the mastering process at Yamagata TEC, providing Sony with a fully integrated production system for stacked CMOS image sensors. This investment is a part of Sony's mid - to long-term plan to increase its total production capacity for image sensors to approximately 75,000 12-inch wafers per month, and is expected to increase the current capacity of approximately 60,000 wafers per month to approximately 68,000 wafers per month by August 2015. Over FY14, Sony is going to invest approximately 9 billion yen (Nagasaki TEC: 3 billion, Kumamoto TEC: 6 billion). Approximately 26 billion yen is to be invested in FY15 (Nagasaki TEC). Thanks to DG for the news. Reuters, Globes: Mobileye, a maker of vision & camera-based ADAS systems starts the roadshow for NYSE IPO of $500M at $3.8B valuation. Mobileye's revenue was $81.2M in 2013. 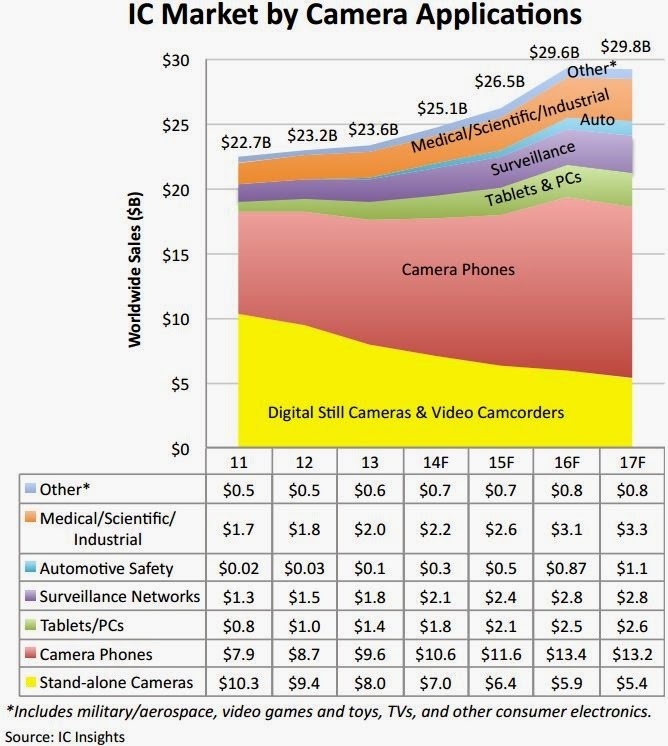 Such a high valuation (for a hardware company) reflects the market expectations for a wide adoption of automotive vision systems. Marketwired: FLIR announces that the FLIR ONE thermal imaging accessory for smartphones will be available on July 23 for pre-order online at FLIR.com/FLIRONE. The award-winning FLIR ONE transforms an iPhone 5 or 5s into a thermal imager. When paired with its iPhone app, FLIR ONE displays live infrared imagery that allows the user to see the world from a thermal perspective. FLIR ONE will also be available to buy in Apple Stores and on Apple.com in August. Thanks to SF for the news. "we assume Largan will continue to outgrow the smartphone industry driven by more dual/multi-camera devices. We think dual cameras can not only support 3D applications but also decrease response time, and have better depth-sensing & low light performance without increasing thickness. We estimate 10% of Chinese smartphones will bundle dual cameras in FY15 which should help Largan extend its global No.1 position and help the company to increase its ASP due to requirements for more precise technology." 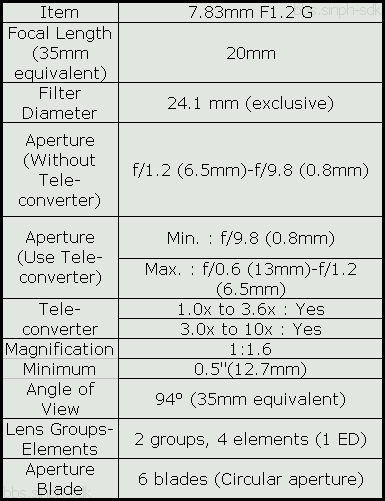 In March 2014, Toshiba quietly published a web page for T4K46, a 1/2.3-inch 20MP image sensor aimed to smartphone camera market. The sensor is based on 1.2um BSI pixels. Its RAW10 frame rate is 12fps at full resolution, and 60fps in 1080p video mode. The sensor's ADC supports up to 12b resolution. "Although we served this very demanding and competitive market segment in the early days up until 2008, we took a calculated decision to concentrate in the high end market segments including: photography (mainly broadcasting and cinematography), large X-ray sensors for dental and medical applications, industrial high speed global shutter sensors, 3D gesture control and automotive and security sensors." 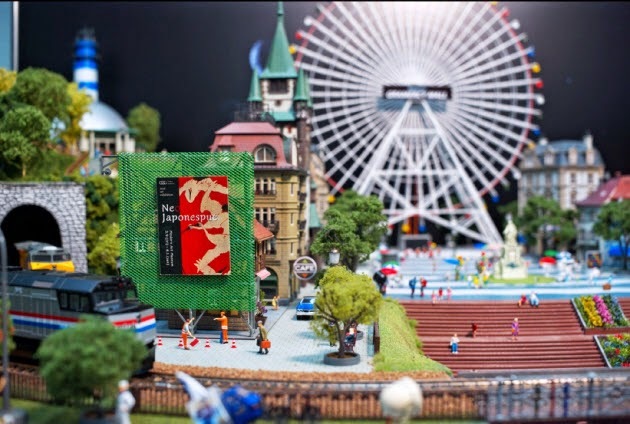 "...the high volume products that require 65nm technology will go to TowerJazz Panasonic Semiconductor Company while the products that require high flexibility and customization will go to TowerJazz. Both companies can also enjoy the 110nm CIS technology of Panasonic that will be transferred to Israel and thus, provide our customers dual source for their products." "...in the X-ray sensor market, due to our patented stitching technology, we have become the largest source for such sensors and our customers dominate around 70% of the worldwide market share in the intra oral dental sensor market." 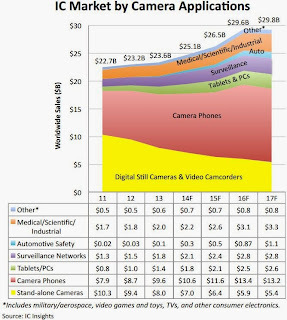 Yahoo, SeekingAlpha: Baird said its checks indicate OmniVision is regaining smartphone market share in China. Baird's analyst sees strong PureCel design activity, and forecasts margin expansion. Cognivue Corp. (Gatineau, Quebec) was spun off in 2009 from Korea's MtekVision to focus on so-called cognitive processing that uses parallel processing engines optimized for tasks such as image recognition and identification. Cognivue provides SoCs, software, and IP to capture, analyze, and render video and images for smart cameras. Dual Aperture Inc. (Palo Alto, Calif.), founded in 2009, has developed a dual aperture RGB-IR sensor technology that can combine imaging and depth perception in a single sensor. The company is pitching the technology to form the basis of gesture recognition command and control in consumer, automotive, and industrial products. Geo Semiconductor Inc. (San Jose, Calif.), founded in 2009, is a fabless semiconductor company that designs video and geometry processing integrated circuits (ICs). Its chips have found use in consumer displays and projection systems, and the company is extending its reach into automotive and security applications. 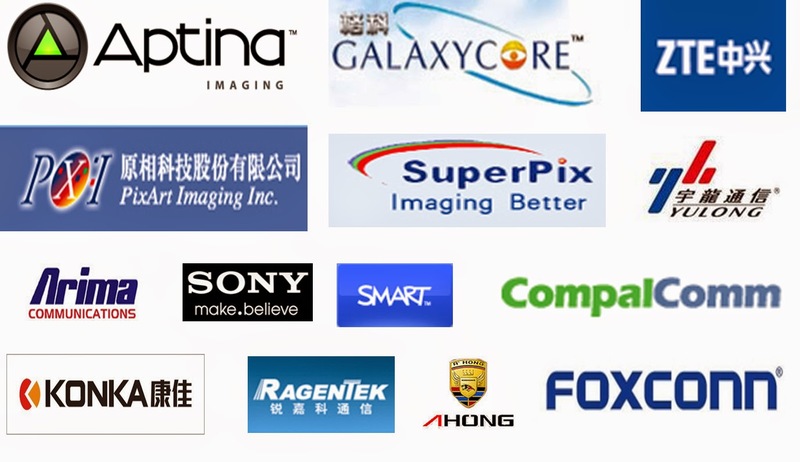 Gpixel Inc. (Changchun, China) develops high-end CMOS image sensor solutions for industrial, medical, and scientific applications. Founded in 2013, the company worked with foundry Tower Semiconductor Ltd. to produce a 150 Mpixel full-frame CMOS image sensor. InVisage Technologies Inc. (Menlo Park, Calif.) is a fabless semiconductor company developing QuantumFilm, an image-sensing technology that it claims has superior performance to silicon. Its first product enables the high-resolution images from handheld devices such as camera phones and PDAs. Founded in 2006, InVisage Technologies is venture funded by RockPort Capital, Charles River Ventures, InterWest Partners, and OnPoint Technologies. 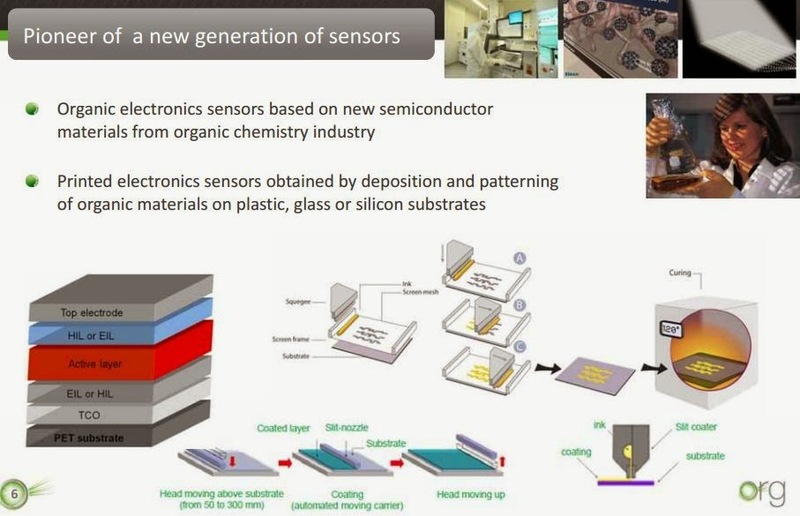 Isorg SA (Grenoble, France), founded in 2010 as a spinoff from CEA-LITEN, converts plastic and glass surfaces into smart surfaces through the application of printed, organic, optoelectronic sensors. The possibility of 3D product integration allows the recognition of many shapes and form factors. The company name is a contraction of Image Sensor ORGanic. Pelican Imaging Corp. (Santa Clara, Calif.), founded in 2008, is commercializing array cameras for the mobile market. Pelican's array camera, essentially replacing a single image sensor with an array of devices, captures depth information and addresses challenges posed by conventional camera design and small pixels. Softkinetic SA (Brussels, Belgium), founded in 2007, is a developer of sensor-to-software 3D gesture recognition systems. It has licensed its platform to Texas Instruments and Melexis. TeraDeep Inc. (Santa Clara, Calif.) was founded in December 2013 as a spinoff from Purdue University to focus on the design of mobile coprocessors and neural network hardware for the understanding of images and videos. Solid State Imaging Forum being organized by Albert Theuwissen announces its 2014 theme and a lecturer: "Advanced Digital Image Processing" by Majid Rabbani, an adjunct faculty at Rochester Institute of Technology (RIT) and the University of Rochester (U of R), IEEE and SPIE Fellow member, and a Kodak Distinguished Inventor. The Forum is to be held on Dec. 11-12, 2014, in Voorburg, the Netherlands. The audience will be strictly limited to enhance and stimulate the interaction with the speaker as well as to allow close contacts between the participants. The Forum registration is open now. 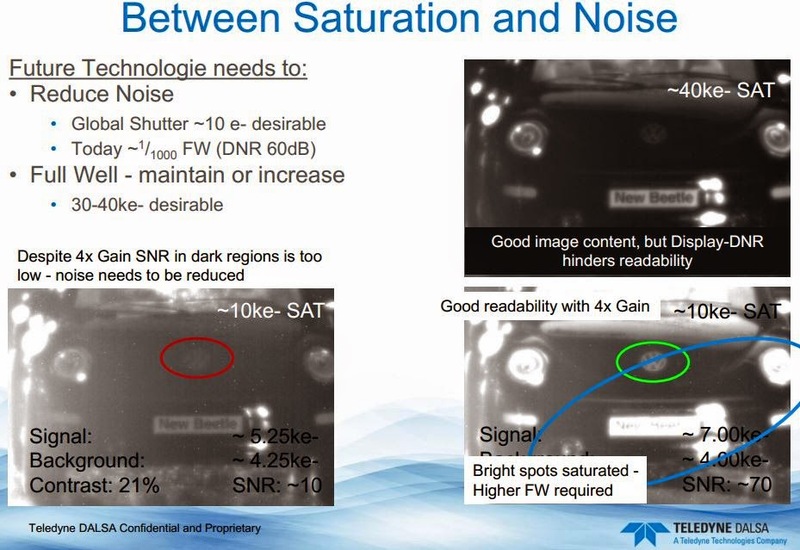 Business Wire: ON Semi's new KAI-08051 CCD provides improved light sensitivity, reduced read noise, and improved color accuracy compared to the previous generation device for applications such as Intelligent Traffic, Surveillance, Medical Imaging, and Industrial Inspection. 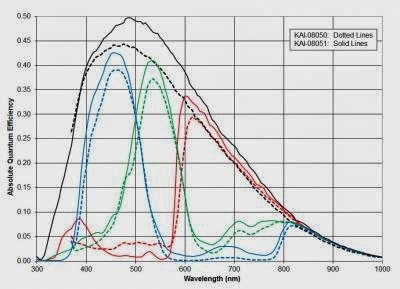 The KAI-08051 shares the same 5.5um pixel architecture, 8MP resolution, 15fps readout rate, and 4/3 optical format as the existing KAI-08050, but improves its performance through the use of an improved amplifier design, newly optimized microlens structure, and new color filter pigments in both Bayer and Sparse color configurations. The KAI-08051 is backward compatible with the KAI-08050, requiring at most minor modifications to the firmware used in existing camera designs. 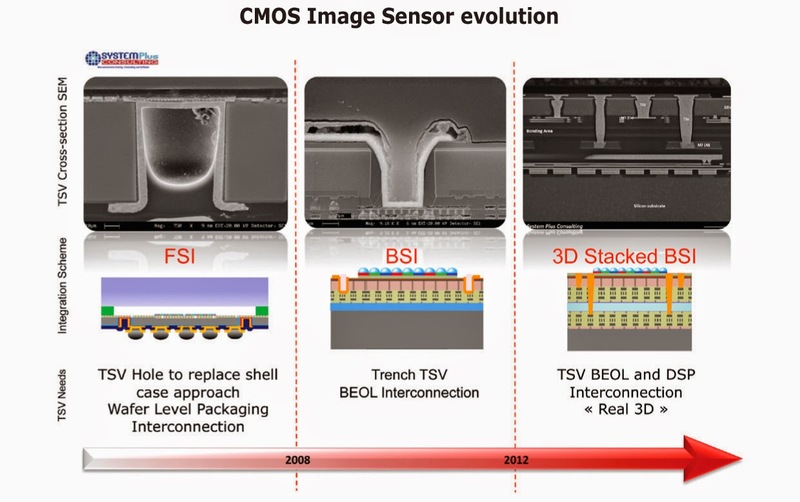 "CCD image sensors continue to provide the critical image quality required in many key applications," said Chris McNiffe, VP Image Sensor Business unit at ON Semiconductor. "The enhanced performance available from the new KAI-08051 Image Sensor reflects our on-going commitment to improve the capability of our existing products and to deliver the industry’s most advanced image sensors using both CCD and CMOS technology." IEEE Spectrum: Palo Alto-based startup Light closed a $9.7M round of venture funding. The stealth-mode startup presents itself as "a team of creative technologists on a mission to reimagine the art and science of photography." Light occupies the same address as Tinz Optics company, and Tinz URL redirects to Light, so IEEE Spectrum speculates that Tinz morphed into Light. Rajiv Laroia, an IEEE Fellow, was in 2013 identifying himself as a founder of Tinz Optics, "a company developing technology that miniaturizes lenses/cameras while preserving the quality." Update: Re/Code got an email from Light CEO Dave Grannan: "The last major technological breakthrough in photography was the move from analog to digital, when traditional film was replaced by a digital sensor. Creation and consumption of photography have innovated, incrementally, around this, but there hasn’t been a real ground-up change in the way we think about the photograph. We’re working on that." Inspired by Albert Theuwissen's PTC courses, Forza Silicon releases PTC plugin for NIH ImageJ freeware image viewing and analysis software package. The plugin computes the PTC, and gives a graphical plot from which the conversion gain and read noise can be fit to the PTC curve. Talking about Forza, it has recently updated web site with a very impressive gallery of the past projects and a history page tracing the company roots to the early JPL works. Bpifrance, Sofimac CEA Investissement Partners, and unnamed angel investors, participate in ISORG financing round totaling 6.4M euros. The new funds will enable ISORG, which already operates a pre-industrial pilot line in Grenoble, build a new production line to start volume manufacturing in 2015, and deploy internationally. The batch of patent applications is supposed to speedup the image sensor readouts or solve the problems with slow readouts. The successive approximation ADC cycle starts from switching the cap array reference to an opposite one. Having the input inversion allows even and odd column ADCs use the opposite polarity references, and thus reduce the reference load and speed up the conversion: "Conventional image sensors are not configured to have conversion circuitry with SAR ADCs having capacitors that charge to opposite voltage references. 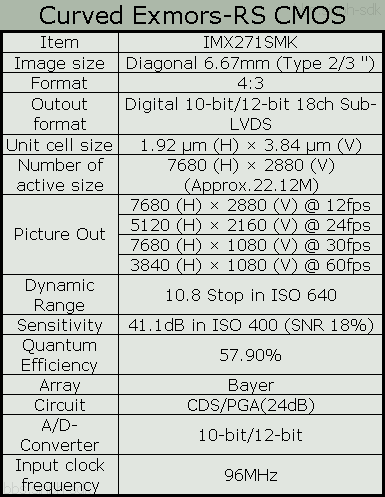 In some conventional image sensors, all of the SAR ADCs in the conversion circuitry are all the same and the capacitors arrays charge to the same voltage reference. This can cause longer settling times for voltage reference because the capacitor arrays inside the SAR ADCs all tax the same voltage reference (at around the same time) by drawing charge from the voltage reference during the SAR ADC's binary search sequence." DPReview quotes Japanese-language Nikkkei article with Sony talking on its curved sensor plans. The article is accompanied by a low resolution image from the curved senasor and says that Sony has difficulties combining curved sensor with "high power optical zoom lens." So, Sony considers to use a digital zoom instead. Albert Theuwissen discusses the slanted edge target approach to measure MTF in his latest posts. The June post describes the basics of the measurement, while the July continuation talks about the edge angle optimizations. Starvis is a BSI pixel design optimized for surveillance cameras with improved sensitivity and noise reduction, typical sensitivity of more than 2000mV per 1 μ㎡ (color, F5.6, 1s accumulated conversion), and improved light utilization by including the NIR range. Pregius is global shutter pixel technology for APS CMOS image sensors that use a low-noise CCD structure, and realizes high picture quality. Haaretz: Qualcomm is buying the Israeli operations of CSR (former Zoran) for about $44M. On June 24, CSR announced it had sold the unit but didn’t disclose the buyer. Now, a spokesman for Qualcomm confirmed it was the buyer. "Telephone is quickly becoming the consumer’s main camera so that the camera function is increasingly becoming one of the main factors differentiating cellphones," Qualcomm said. "Camera functions are right now one of the main considerations of consumers when they buy a phone. This acquisition will enable us to continue successfully developing cameras so that smartphones will provide the same quality as a digital camera." 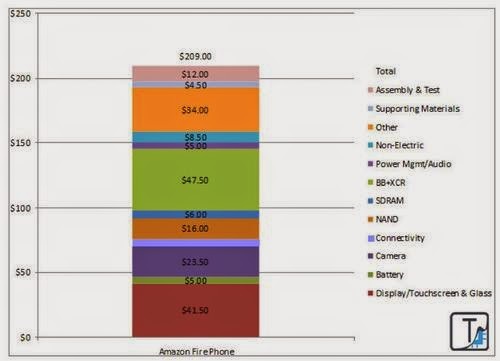 Update: EETimes publishes few more details on the deal.